As of June 19, eLoran is on the air in the United States. The low-frequency signal emanates from a single station, a former U.S. Coast Guard Loran Unit in Wildwood, N.J., which sports a 625-foot signal mast that has been out of action for five years. The signal is receivable at distances of up to 1,000 miles. The facility began generating eLoran pulses at the press of a command button by Congressman Frank LoBiondo (R, N.J). Present for the ceremonial start of a 12-month demonstration and research program under the aegis of the Department of Homeland Security were project participants Charles Schue, CEO of UrsaNav; Pam Drew, president of Harris Information Systems; and Dana Goward, president of the Resilient Navigation and Timing Foundation. GPS services are essential to national and economic security, yet are vulnerable to disruption. 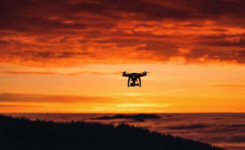 The eLoran navigation and communications signal has features that are complementary to GPS, making it difficult to disrupt; further, it could be an important part of enabling UAVs to fly safely in our airspace. The U.S. Federal Radionavigation Plan cites not being critically dependent upon a single system for positioning, navigation, and timing as a national policy objective. The plan specifically identifies eLoran testing as an important step toward reaching that objective. The two engineering companies, UrsaNav, a supplier of eLoran technology, equipment, and services, and Harris (which recently acquired Exelis), provide funding and technology for the tests supported by the U.S. Coast Guard, Department of Defense, Department of Homeland Security and other federal agencies under a Cooperative Research and Development Agreement (CRADA) announced in May. The team will evaluate eLoran as a potential complementary system to GPS, exploring the capabilities and use methods of eLoran in depth to identify all strengths, capacities, and potential vulnerabilities of the technology. One goal of the CRADA is to reduce the size, weight, cost, power needs and other aspects of Loran, similar to what has evolved with GPS. Dana Goward, also a retired Coast Guardsman whose non-profit Resilient Navigation and Timing Foundation is working on the project, stated that eLoran can attain positioning accuracy of six meters or better. In this GPS World exclusive video, Admiral Thad Allen, former commandant of the U.S. Coast Guard, discusses PNT alternatives to GPS for navigation, including eLoran and the activation this week of the signal on the eLoran tower in New Jersey. Matters have moved a little further along in Europe. In 2013, the General Lighthouse Authorities of the UK & Ireland (GLA) established prototype eLoran Initial Operating Capability (IOC) in the United Kingdom, where eLoran now delivers PNT data at the 10-meter level from a network of high-power, low frequency, terrestrial transmitters. “To get high accuracy from eLoran requires accurate calibration of Additional Secondary Factor (ASF) through measurement,” according to paper delivered at the Institute of Navigation’s 2015 Pacific PNT meeting. “Can eLoran Deliver Resilient PNT?” was authored by Nick Ward, Chris Hargreaves, Paul Williams, and Martin Bransby of the GLA. The older Loran-C system suffered from significant positioning bias errors due to a number of radio frequency signal propagation delay factors, they write. “The Primary Factor (PF) is due to the signal travelling slower in air than free-space, the Secondary Factor (SF) is due to the presence of the Earth’s surface and the electrical properties of the oceans. Additional Secondary Factor (ASF) is due to the additional electrical resistance encountered by non-seawater terrain, land, mountains, deserts, and so on. PF and SF can be modeled, but to get high accuracy from eLoran requires accurate calibration of ASF through measurement. “To do this,” they continue, “ASF surveying and mapping has been conducted along the port approach channels at Aberdeen; along the Firth of Forth; Middlesbrough; Hull and the Humber Estuary Traffic Separation Scheme (TSS); Harwich and Felixstowe; The ports of London, Medway and the approaches past the London Array wind-farm and also through the Dover Straits. “To complement these services, seven differential-Loran (DLoran) Reference-Stations, one located close to each of these survey areas have been established. These stations monitor the time of arrival of the received eLoran signals, and generate differential-corrections that are broadcast via the Anthorn Loran Data Channel (LDC), to account for temporal variations in these ASF maps. eLoran can deliver Resilient PNT and this has been demonstrated on several vessels. Seamless handover from primary (GPS) to secondary (eLoran) positioning source has been successfully implemented. Surveying and mapping of ASF has been carried out for several major ports and the required levels of performance demonstrated. DLoran reference stations to correct for short-term, temporal variations have been installed and commissioned. Good levels of performance have also been demonstrated for coastal voyage phase away from the ASF surveyed areas. eDLoran in Rotterdam. 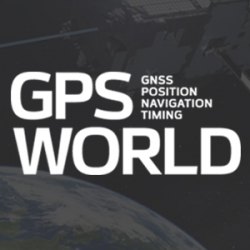 The July 2014 issue of GPS World presented a cover story showing results of a newer version, enhanced differential Loran (eDLoran), yielding position accuracies of approximately 5 meters. A new enhanced differential Loran system demonstrates 5-meter accuracy not achievable by the current DLoran system, and requires less expensive reference stations. A prototype tested in Rotterdam’s Europort area uses standard mobile telecom networks and the Internet to reduce correction data latency — a key source of error — by one to two orders of magnitude. Figure 12. The large ship symbol (grey) is derived from the GPS-RTK receiver of the Rotterdam pilots. The width of the ship symbol is 10 meters and the speed-over-ground was 11 kts. The red triangle is generated by the eDLoran receiver and remains between the required ± 5 meter limits for eDLoran. Figure 13. The red track is based on raw eLoran data without any corrections. The transparent blue line is made by GPS-RTK and is widened to 10 meters giving the required ± 5 meter limits of eDLoran. The white line is output from the eDLoran receiver which stays within the borders of the 10 meter wide transparent blue line. “A compatible system (eDLoran) has been developed for operation by ships’ pilots on the Europort approach to the Port of Rotterdam. “However, Loran is a regional system dependent on international collaboration. The 9 transmitters in northern Europe are operated by Denmark, France, Germany, Norway and the UK. South Korea is implementing a national eLoran service, and it is understood that similar plans are being considered in Russia and China. Meanwhile, the U.S. Army is interested in eLoran PNT for the warfighter.